Given the jazz-inflected complexities and somber, introspective tone of Joni Mitchell's most vibrant work, the skill and magnetism of the artists who took the stage on the first of two nights celebrating her 75th birthday at the Dorothy Chandler Pavilion at L.A.'s the Music Center felt all the more impressive. 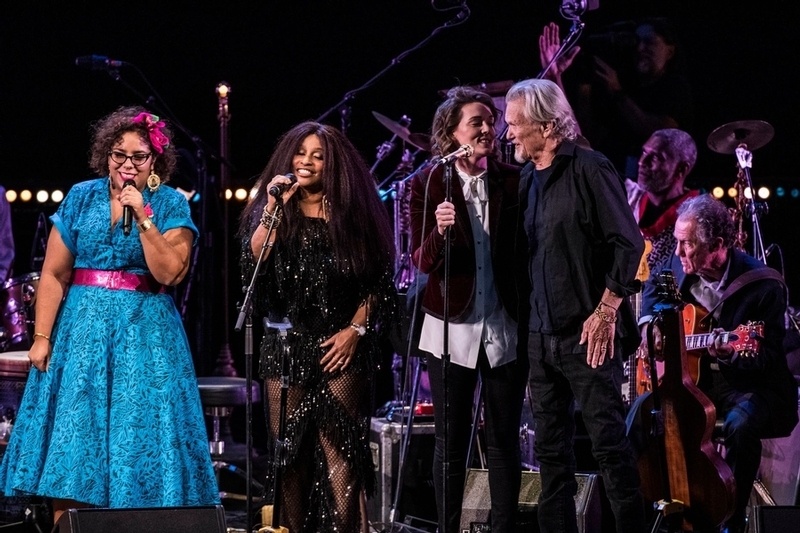 Over the course of a breathless two-and-a-half hours, a carousel of musicians - some of her decades-old familiars like Graham Nashand James Taylor, others fresher talents like Brandi Carlile and Norah Jones - took turns paying tribute to the iconic singer-songwriter on Tuesday night in a master class of interpretation. It wasn't surprising that Mitchell herself didn't grace the stage, given her proclivity for hermitage and recent health battles. Since she had a brain aneurysm in March 2015, her public appearances have been altogether minimal - she was only recently spotted backstage embracing Taylor at his Hollywood Bowl show in June, and before then once or twice. But she was properly represented at the show, led by musical directors and Mitchell collaborators Jon Cowherd and Brian Blade, set to the backdrop of photos of Mitchell throughout the decades and her paintings on full display amid video messages from Elton John and Peter Gabriel, as well as audio clips sourced from archive interviews. The star power was world-class. Chaka Khan, Diana Krall, Kris Kristofferson, Emmylou Harris, Glen Hansard, Rufus Wainwright, Seal, Los Lobos, La Marisoul, Cesar Castro and Xochi Flores took turns throughout, some altogether faithful to the source material and others more liberal. The highlights were unexpected and, when surprising, electric. Near the end of the first act, Seal, who had earlier joined Wainwright on backing vocals as Khan blasted through a rendition of "Help Me," stepped into the spotlight for the tender "Both Sides Now," pianos ricocheting against his limber tenor. It was the first of two solo performances from Seal - his second was "A Strange Boy" - both of which received standing ovations from the crowd and felt truly connected to the originals. Only Carlile, who beamed at Kristofferson while harmonizing on "A Case of You," elicited the same response. Her gentle falsetto sounded nearly identical to that of Mitchell, minus the country twang; the familiarity wasn't lost on the audience. Elsewhere, Wainwright tried on the challenging "All I Want" with ease, padding it with a wink-nod: "This is a fun song to sing." Krall nestled into the velvet-lined "Amelia," and Jones sang a faithful "Court and Spark" and took to the piano for the 1993 deep cut "Borderline," while Harris took a break between "Cold Blue Steel and Sweet Fire" and "Magdalene Laundries" to add her own sort of levity. "[Joni] never shied away from a dark subject, and I think that song was from 1972 and she was writing about heroin addiction that was prevalent," she said. "So anyways, I'm going to lighten the subject now and sing about the slavery of Irish girls in convents." Revue performances can often slog, especially when they feel disingenuous. It's why Nash, who had a relationship with Mitchell in the early Seventies and lived with her in her Laurel Canyon home for some time, brought back the focus after intermission. "I'm honored to be here," he said. "Most of the songs you hear tonight will have been written by Joan, except this one. I wrote this one for Joni over 50 years ago." It was a piano ballad version of "Our House," included on Crosby, Stills, Nash & Young's 1970 sophomore album Déjà Vu, one of the most extraordinary songs about the ordinary of domesticity. It echoed through the hall, the attendees singing along to every word. Taylor, who had previously participated in a televised Mitchell tribute in April 2000, perched on a stool and strummed on his acoustic guitar for "River" and "Woodstock," the latter of which Mitchell originally released on 1970's Ladies of the Canyon. An audio clip from Mitchell ran before he took the stage: "There have been times where I over-felt certain songs," she said. "When I wrote 'Woodstock,' two or three times that I first performed it, I had to stop before I would get so caught up in emotion. I guess it was because I didn't go to Woodstock but I watched it on television and it seemed like an amazing thing to me that under the circumstances, that many people helped each other out, they delivered babies in the wild, they shared their food. There was so much brotherhood. ... It really moved me." The unifying effect of Mitchell's music rang out with a closing group singalong to "Big Yellow Taxi," one of the more ebullient standouts from her oeuvre. The billed artists stood side by side - with the exception of Jones and Krall, who whispered to one another while adjacently seated at a piano - and belted the number, a bright rumination on the harrowing effects that man has on society. They each delivered solos, then bowed in unison, as a portrait of Mitchell loomed in the background, a fitting homage to an icon whose presence is still felt, even in her absence. This article has been viewed 626 times since being added on November 9, 2018.